Emperor Ed is the ruler of Sky Land, and appears in The Adventures of Super Mario Bros. 3 episode "Up, Up, and a Koopa". He is an elderly mustached Toad. When King Koopa and Kooky von Koopa plan to take over Sky Land with their Kooper-Dooper Raiser-Upper, they kidnap Emperor Ed, and put him in a jail cell on the Doom Ship. Ed tries to threaten the two Koopas, but is ignored and intimidated by the Rocky Wrench jailer. After King Koopa turns up the power of the Kooper-Dooper Raiser-Upper, the Doom Ship begims to shake and Emperor Ed falls out off the porthole. Luckily, Ed falls on a floating bed, which promptly falls to the ground. Ed then jumps out of the bed, accidentally landing on Toad. 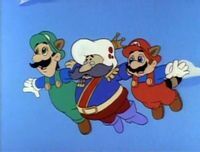 The Mario Bros. promise to help Emperor Ed, and go to confront the Koopas after dropping him off at his castle. Ed and his subjects protest against King Koopa after he declares himself the ruler of Sky Land. King Koopa and Kooky are defeated shortly afterwards by the Mario Bros., and Emperor Ed and his subjects return to peace. This page was last edited on April 23, 2018, at 13:13.